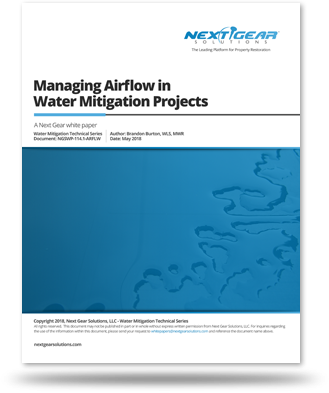 White Paper – Managing Airflow in Water Mitigation - Next Gear Solutions, Inc.
Best practices of maintaining effective use of airflow to enhance evaporation. Properly configuring your airflow saves time and money . The core function of a water mitigation project is to remove excess water from an indoor environment using cost-effective methods and procedures to reduce the damages that would otherwise result from the abnormally wet condition. There are two stages of water removal during a mitigation project. The first is bulk water removal in liquid form, commonly referred to as extraction. The second is the process of drying structural materials and contents by way of enhancing evaporation. The amount of ti me necessary to complete the drying phase is governed by the amount of excess moisture present and rate of evaporation. This paper explores the rate of evaporation, and specifically the role airflow plays in controlling its speed. Information related to evaporation and airflow from the scientific community is discussed, followed by a review of current industry standards and practices. The paper concludes with suggested methods for implementing best practices and maintaining effective and efficient use of airflow as a core technician skill set.